Are you over 65? You’re in luck, a very large portion of the Tokyo population is over 65 as well! So much so that they have their own shopping street. 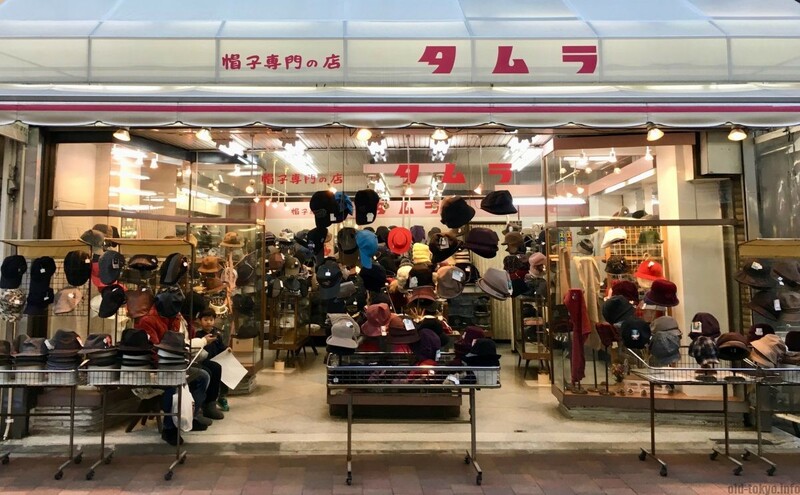 Sugamo Jizō-dōri is actually more like a regular shōtengai, a 800 meter long traditional shopping street that has a wide range of clothing, grocery and furniture stores, as well as restaurants and cafes. Sugamo has the reputation in Tokyo to be only for old people, but I felt that a lot of the people I encountered were quite young. I saw many high school students, university students, young couples and families with kids. That goes against the main idea that goes around in Tokyo that this neighbourhood is solely for the very old. 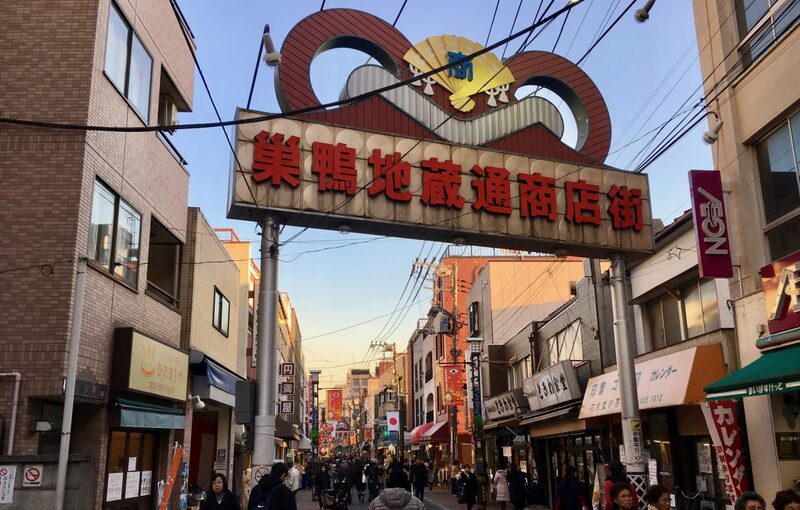 I walked along Sugamo Jizō-dōri several times and I kept asking myself, what makes this street special? 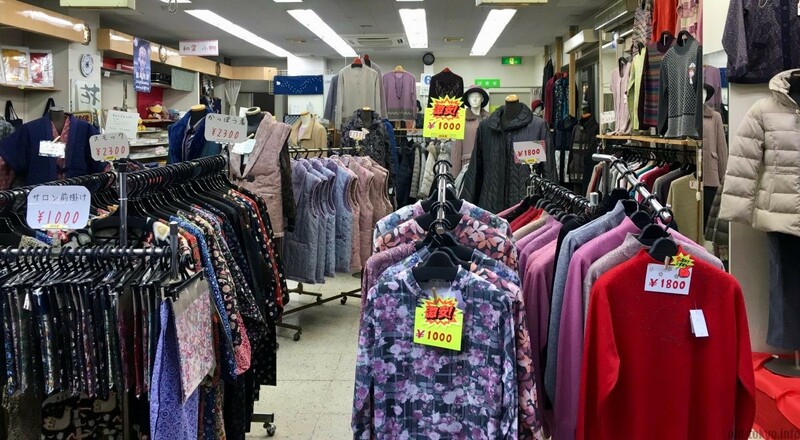 I saw many of the same shops I see on other shōtengai, but one thing is indeed special: numerous (cheap) clothing stores catering to senior citizens. Hence, its nickname “Harajuku for old ladies” (in Japanese Obāchan no Harajuku) is not too far fetched. Regardless of what the street is known for these days, the street has an interesting history as well. It used to be part of the Nakasendō, one of the five important routes of the Edo period (1603-1868), and one of the two that connected Edo (nowadays Tokyo) to Kyoto. In fact, Sugamo was the first resting stop on this road that started from Nihombashi (about 8km away) and due to that function it gradually developed into a town. This street evolved further through the presence of Kōganji (高岩寺). This temple was moved here from Ueno in 1891. It was from that time onwards that the street started developing as a shopping street. The original temple was unfortunately destroyed in 1945, but rebuilt in 1957. This temple is famous for Togenuki Jizō, which means thorn-removing-buddha, and you can pray to him to get thorns removed from your body and mind. To get your thorn removed, you should buy a piece of paper of the Jizō’s image, conveniently sold at the temple. And then you apparently have to eat it (according to one legend), a more common way is to stick it to the place where it hurts. Kōganji is particularly popular with senior citizens, and this is the reason why this street has become so popular with the old generation. You will see them lining up to pour water over the black Togenuki Jizō statue. It is said that if you pour water over the part of your body that hurts and you then wipe it with a towel, then that pain will disappear. While the temple still attracts a lot of visitors, I think the main lure is now the 200 shops located on this street. There are a couple of interesting ones that stand out. 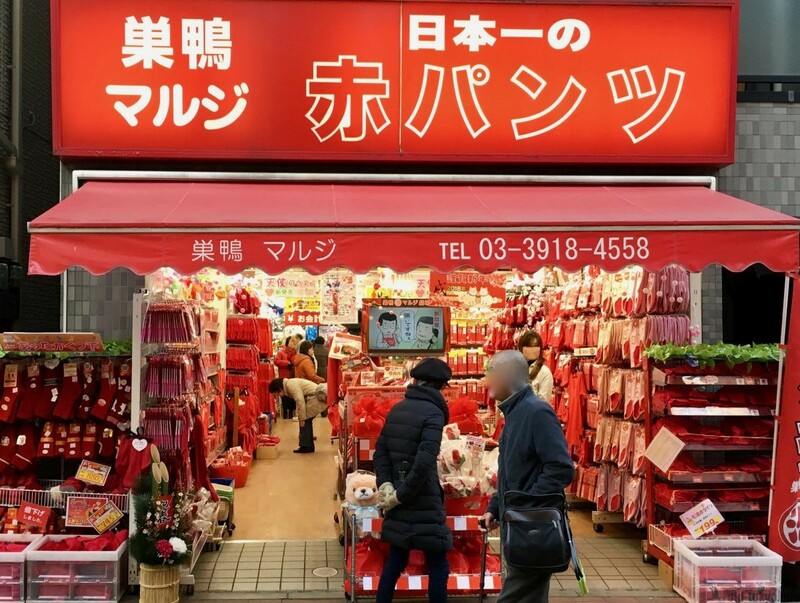 It stands out and is unique, so it is easy to understand why this speciality shop with red underwear from Maruji attracts the most attention in Sugamo. Red underwear is thought to bring luck and prosperity to the wearer. The reason why it became a thing here is because it is indeed most popular with the older generation. The red underwear is said to restore your health. Linked to Chinese medicine the color red apparently improves your blood circulation if worn a little bit below the navel area. They are selling not just underwear, but any type of red clothing. They have also a store just for men’s red garments. All kinds of traditional sweets have a dedicated shop on this street. In particular shio-daifuku is renown in this area. They can be bought at Mizuno, established in 1937. Daifuku is a Japanese confection consisting of a small round mochi stuffed with sweet filling. Shio-daifuku is one type of this type of sweet with an anko filling (unsweetened) and has a slight salty taste. Do not stop at trying just the shio-daifuku, Sugamo Jizō-dōri has a wide range of wagashi (Japanese sweets) to try. I am actually more a fan of more sweeter varieties of the daifuku and I would rather go for ichigo-daifuku (strawberry daifuku) or mame-daifuku (azuki beans daifuku). 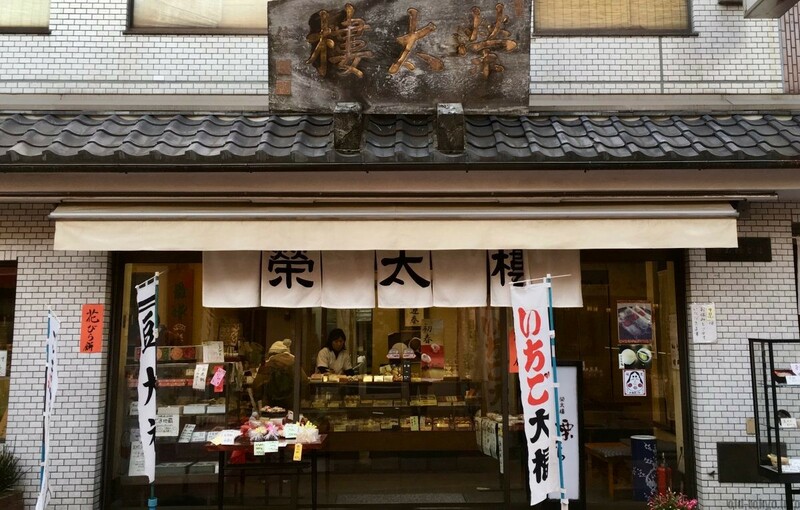 Many of these wagashi shops are pretty old, such as Eitarō (established in 1930, older than Mizuno), famous for a whole range of Japanese sweets. When I visited they were promoting their ichigo-daifuku that is usually eaten in spring. When I first came to Japan as a poor student, I loved going to teishoku restaurants (set meals). They were easy and cheap, as well as remarkably healthy. Tokiwa Shokudō offers set meals as in a cafeteria (shokudō actually means cafeteria/messroom). They are specialized in seafood, particularly ajifry (fried horse mackerel) and sashimi are popular, or oysters when they are in season. 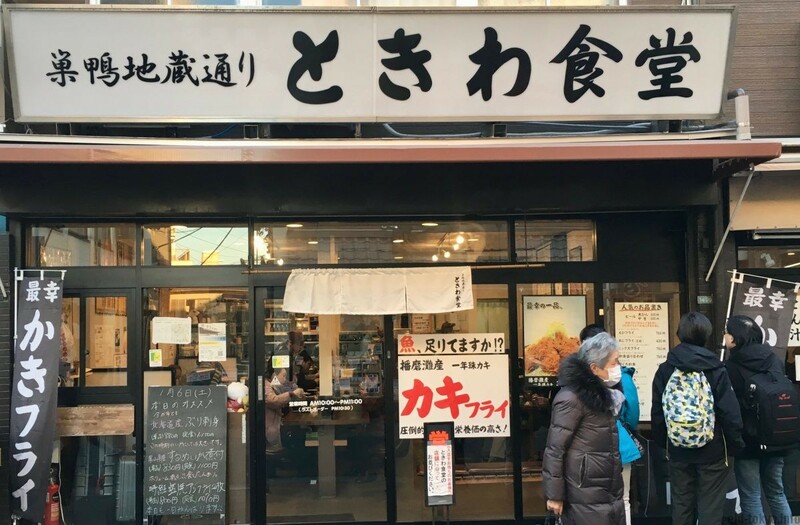 Tokiwa Shokudō has not just one restaurant on this street, but 3! In addition they have one in nearby Komagome. The nicest one to go to is the biggest one in the middle of the street (87 seats). It was established at the end of the 1980s. Please note that this restaurant is different from restaurants with the same name in Tokyo such as the one in Asakusa. Many restaurants have this name dating to a famous high-class restaurant in Tokyo at the end of the 19th century and early 20th century. However, they are not a chain and all have original dishes. Apart from these 3 there are many other places to go. You can find on this street some of the best speciality foods from all over Japan, selling only the very best Japanese ingredients. Traditional Japanese snacks and sweets are also covered, from taiyaki to kantoro-ame. While the street is old, I could not find too many really very old stores, but there are plenty with a very long history such as the first bakery in Japan that started selling anpan (bread with anko inside). This bakery (Kifukudo http://www.kifukudo.com/) was established in 1916. When to best visit? 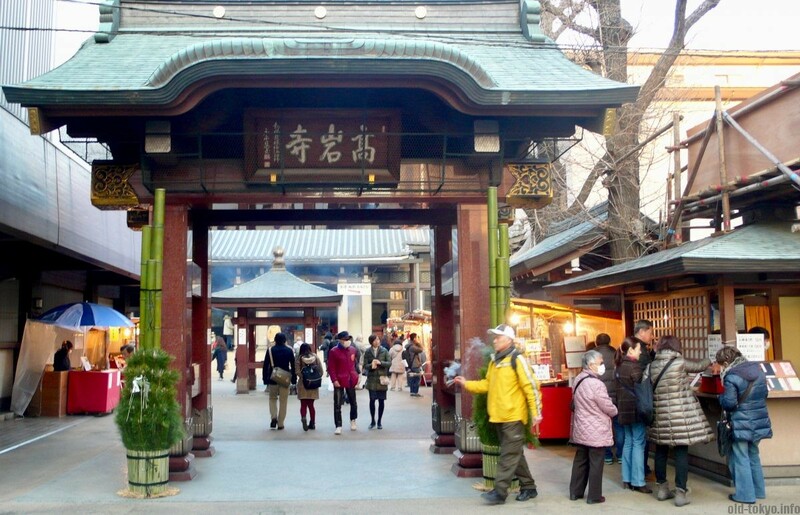 Every 4th, 14th and 24th Kōganji holds a festival and Sugamo becomes more lively.